While Honda has recently announced plans to increase its NSX allocations to the United Kingdom as demand outstrip supply, the car isn't doing so well in Australia. According to CarAdvice, the Japanese brand has only sold two NSXs in the country since the model was launched last year. Even though Honda says it is working on three other orders, the amount of units sold is still pretty little compared to the amount sold by its rivals. Audi has since sold 21 R8 V10 plus this year while Mercedes has sold 72 units of its AMG GT. Even the aging GT-R Nismo has been sold to 21 owners. 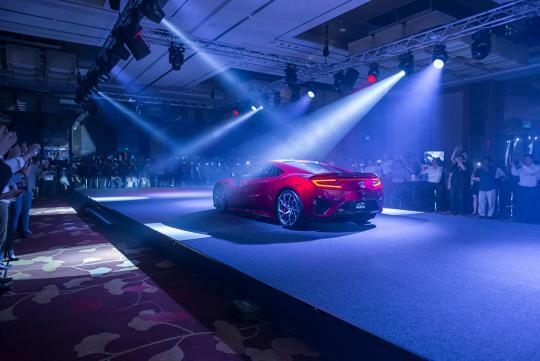 However, Honda doesn't seem concerned as Public Relations manager Neil McDonald said the NSX is halo vehicle and it "wasn’t positioned, nor was it expected, to chase outright volume sales." Well, I'm sorry to say this, but the new NSX can't hold a candle to the old (and still great) NSX. It's a watered-down compromise model. i think it's a no brainer. R8 and amg gt vs NSX. you have to be a DAMN big NSX fan to choose this over the other 2. And in the SG context, other choices abound for the ridiculous price point of the NSX set by Kah Motors. You can get a Huracan for the same amount, give or take a few 10k. The only people this would appeal to are crazy Honda fanatics who've already got a stable full of supercars so they can afford to throw away a lot of dosh on an overpriced underperformer just to complete their collection or scratch an itch. What I said doesn't apply to cars like the Lexus LFA, that actually gave mind-blowing performance and were worth the money for the exclusivity and the whole experience that came with it. And of course, the Nissan GTR is an even cheaper supercar alternative. F type R and AMG GT are actually MUCH cheaper and A LOT prettier than NSX, haha. OMG mclaren 570s is nearly 200k cheaper!!!!! I believe one "smart" guy in SG bought it. Most likely waiting for it to become a limited edition since not many will be built just like the Lexus LFA ...expensive ,, but is it worth it?